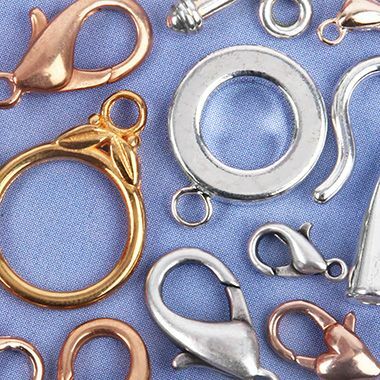 Jewellery findings is the collective name for all the components and pieces that are used to create, connect, join and finish off jewellery. 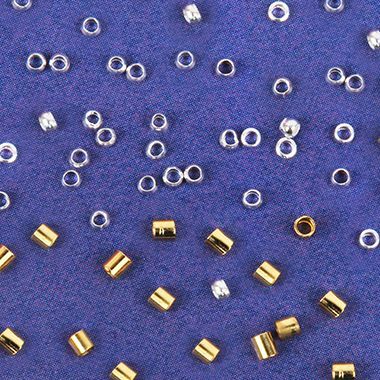 Crimp Beads and Crimp Tubes are made of a soft metal which is ideally used with Beadalon Flexible Jewellery wire to secure the ends of your jewellery designs. Simply thread wire through a crimp, through your desired clasp or item you want to connect, and then thread back through the crimp. Squash flat using flat nose pliers or crimping pliers to secure it in place. 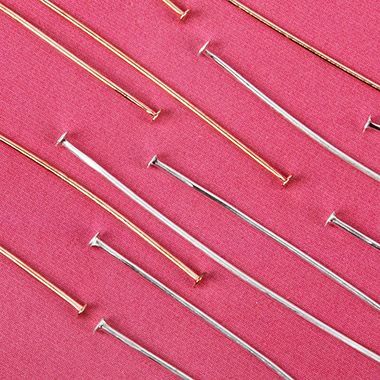 Eyepins are a piece of wire with a loop at one end and they are used to connect your jewellery pieces together. Thread a bead or a group of beads onto the pin and make a loop at the opposite end using round nose pliers or the one-step looper. Connect each loop to the next jewellery component in your design. 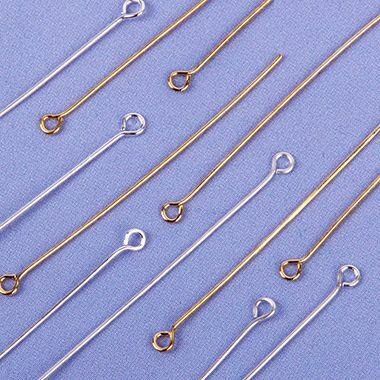 Headpins are a piece of wire with a head to stop beads from coming off. They are used to make bead dangles, practically earrings. Thread on the beads, making sure the head is big enough to stop the beads coming off. Try adding an extra small bead to the bottom if the main bead is coming off the pin. Make a loop at the opposite end using round nose pliers or the 1-step looper tool. Attach the loop to your jewellery design and let the beads dangle down. 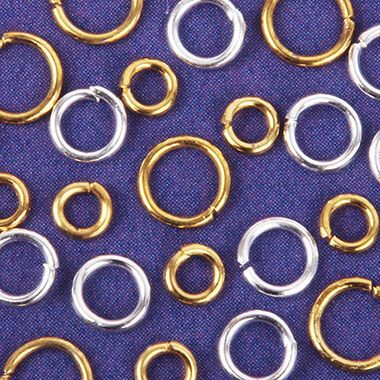 Jump rings are rings used to connect items or attach a clasp or fastening. They can be opened and closed by twisting (don't pull them apart as this will cause them to lose their shape). Grip either side with flat nose pliers and twist each hand in the opposite direction. Connect on to your jewellery and twist again to close. Cords Ends are perfect for fixing your cords into, to finish off your design. Below are a variety of ends you may wish to use. Folder Over Ends – place your chosen cord inside these ends and fold the end over the cord using your flat nose pliers. Clamp/Ribbon Cord Ends – clamp these ends onto your cord to secure it into place. Glue-in Ends – use glue to secure your cord into each end. 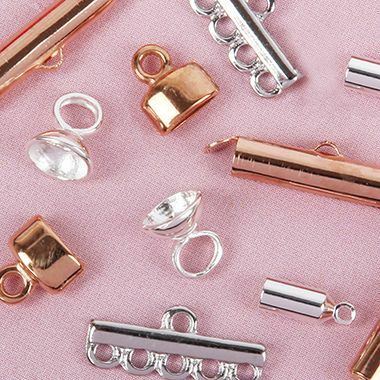 Calottes – these are really neat way to finish off necklaces or bracelets. Post the wire or thread through the small hole, knot or crimp to keep the end inside. Close the calotte together like a clam shell and your knot or fixing is neatly covered! Turn the loop to close and use to attach to a clasp. Wire Guardians – these are strung onto the end of your wire to protect the wire and are perfect to be attached onto your clasp. Clasps are used to finish off your jewellery design. Depending on the thread you have chosen and personal preference there are several types of clasps you could choose from. Lobster (Trigger) Clasp – have a smaller trigger that pulls back and opens the clasp which you can hook onto a ring to close your necklace/bracelet. Magnetic Clasp – these are ideal for lightweight jewellery designs and are easy to fasten. Box/Multi-Strand Clasps - have more than one loop to connect on to. Choose the right number of loops to suit your project and create a wide bracelet or necklace design. Toggle Clasp - Toggle clasps are made of two parts, a bar and a toggle. The T-shaped bar turns on its side to slot in to the toggle and then sits across the opening to stay in place. Hook Clasp – are a simply way of finishing your design. Simply attach to your design and hook the clasp ends together.